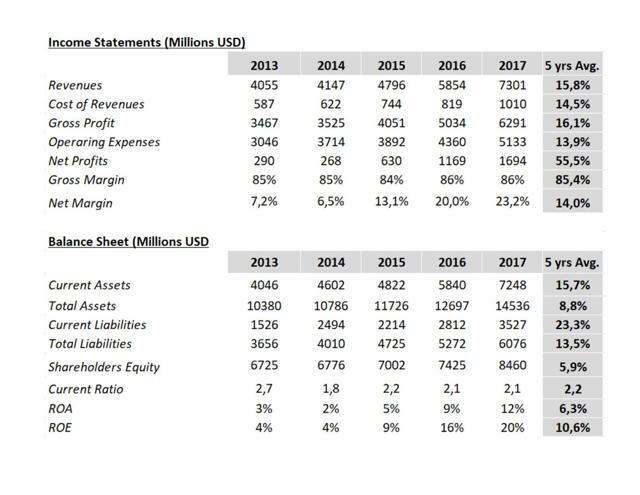 Adobe Systems Inc. (NASDAQ:ADBE) has produced some amazing financial results during the last 3 years (2015 to 2017). 2018 is looking to be a record year for the company. Even if the stock is currently selling at a Price-Earnings ratio above 50, I think the company is still a good investment for growth investors. The company’s strategy to focus on selling its products via its Cloud/Subscription plans has improved the net margins dramatically. This trend should continue as sales from its product subscription plans now make up more than 80% of its total revenues. As we can see in the Income Statements table, revenues have increased at a growth rate of 15.8% per year between 2013 and 2017. Even better, revenues grew by 23% between 2015 and 2017. If we look at ADBE’s quarterly results for 2018, we can estimate revenues to reach $8.7-8.8 B by the end of 2018, which would represent a 1-year growth of 20%. What I like the most about ADBE’s financial performance is the improvement in net margins. Profit margins improved from 7.2% in 2013 to 23.2% in 2017. If we look at the company’s quarterly results for 2018, we can expect the net margin to be around 27-30%. This is quite an improvement from 2013. As we can see, and as we will discuss in the ‘Discussion and Outlook’ section, the company is now generating a very large percentage of its revenues from its Cloud subscription plans. We will also discuss how the company has categorized its products into 3 reportable segments: Digital Media, Digital Marketing, and Print & Publishing. A quick look at the balance sheet shows that the company is in a good position to cover its short-term liabilities, with a current ratio above 2. Liabilities are growing at a faster pace than assets, as ADBE made a few acquisitions during the last 5 years. The company also bought Magento and Marketo in 2018. Investors should keep an eye on this aspect of the business as we move forward. Stockholders’ equity grew at a modest rate of 5.9%. I like to see equity grow at a faster rate. However, the company completed some acquisitions and repurchased some of its shares. At this time, I am not too concerned about the growth in liabilities and the modest growth in shareholders equity. The output of my DCF model provides a price per share of 251$ / share. At its current price of 248,15$ / share, the shares seem to be selling at a fair value. The price target for the next year (12 months) is 280$ / share. This is 12% above its current market price. Given the numbers in the table above, I conclude that ADBE is selling at a decent Price-Earnings given its expected growth potential. The question here is whether the trend is sustainable or not. I will discuss the company’s growth potential during the next 5 years. The main driver behind the improvement in net margins is that the company now makes most of its sales from monthly or annual subscriptions. Users now download the products and pay a monthly/annual fee to use them. The company does not have to print CDs, package them and sell them through stores anymore. Purchasing is now made on the net directly to ADBE. Most software companies are now using this strategy to sell their products. Costs to produce the CDs are now a thing of the past, and the profits do not have to be split between developers and store operators. As we have seen in the Financial Results section, ADBE’s percentage of sales produced from its Subscription plans has increased year after year and now makes up 84% of its revenues (2017). I expect this trend to continue and reach +90% within the next 5 years. Revenues from all 3 of the company’s segments are shifting to subscription plans. In ADBE’s financial statements, the company recognizes its revenues from 3 distinct segments: Digital Media, Digital Marketing, and Print & Publishing. The Digital Media Segment is the most lucrative of the segment, and the one growing at a faster rate. The products listed under this segment include Adobe Photoshop & Lightroom, Adobe Illustrator, Adobe InDesign, to name a few. These products are used by professionals working in graphic design, photographs, web developers, animators, designers, etc. Even if the competition is stiff, most notably from Apple (NASDAQ:AAPL), Autodesk (NASDAQ:ADSK), Corel, and Microsoft, the branding of ADBE’s products is solid and we should expect these products to be in high demand by graphic design professionals in years to come. ADBE also offers various plans to its users. Its clients can choose the plan that suits them so they can use the products they need to support their work. The Digital Media Segment Subscription Plans are supported by Adobe Creative Cloud. The Digital Media Segment makes up 68.5% (2017) of ADBE’s revenues. With an average growth rate of 27% between 2015 and 2017, I expect this segment alone to provide 10-12% growth during the next 5 years. The Digital Marketing Segment is the second-largest segment of the company. The products from this segment are offered through Adobe Experience Cloud. The products offered through the Experience Cloud includes Adobe Analytics, Adobe Audience Manager, Adobe Experience Manager, Adobe Media Optimizer Search, etc. These products enable customers to develop their web marketing strategies and help them deliver their products to their targeted audience. This segment represents 30% of ADBE’s Revenues (2017) and it is growing at a rate of 18.5% since 2015. The competition is, however, quite stiff, most notably from Google (NASDAQ:GOOG) (NASDAQ:GOOGL). The company should be able to grow its revenues from this segment because of the growth potential from the Web Marketing/Advertising market. However, because of the presence of Google, I would expect the growth rate to slow down in the following years. A growth rate of 10-12% from this segment would provide 3-4% growth in ADBE’s top line during the next 5 years. ADBE’s latest acquisitions (Magento, Marketo) should boost the offering from this segment. 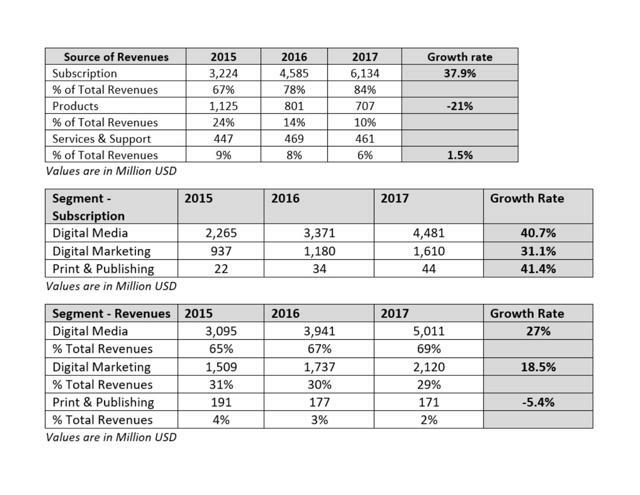 It remains to be seen what will be the impact of both acquisitions on the profitability and growth of the Digital Marketing Segment. The Print & Publishing Segment of ADBE generates the smallest percentage of the company’s revenues. The star product offered under this segment is Adobe Acrobat. This is one of the better-known products offered by ADBE. This segment only accounts for 2% of ADBE revenues (2017). Revenues from this segment have been declining since 2015 at a rate of -5.4%. At this point, I do not think that the Print & Publishing Segment will have a large impact on the company’s growth during the next 5 years. We have noted above that the Subscription plans have a positive impact on the company’s net margins. We must also acknowledge that subscriptions have another non-negligible advantage: Recurring revenues. Monthly and annual fees cost less to customers upfront, but after 2-3 years, the company will generate more cash flow than collecting cash by simply selling its products once. Monthly and annual fees are also easier to predict, which will reduce some of the risk when analyzing the company’s financial results and predicting future income. And approximately 90% of our revenue in Q3 was from recurring sources. ADBE generates its revenue across the globe. However, as we can see in the table below, sales from the United States represent above 50% of the company’s business. Even if the American market will still provide most of the growth during the next 5 years, I see a real opportunity for the company to gain market shares in Europe and in the Asia-Pacific area during the next 10 years. This could be a major growth driver for long-term investors. We transitioned our Adobe.com sites in Europe to comply with new GDPR requirements, and we are successfully engaging with potential and existing customers – allowing us to continue to drive growth in revenue and ARR. The company has its share of risk that could undermine the profitability of its operations in years to come. Stiff competition from heavyweights such as Microsoft, Google, Apple. Currency fluctuation: The company reports its revenue in USD; however, it transacts around the globe in various currencies. Interest rate: The company’s liabilities are manageable; however, a rise in the interest rate could have an impact on future cash flows. Market risk: The company currently has a valuation above market average. Given the volatility of the market, growth stocks such as ADBE could undergo larger fluctuation than other stocks. Solid products, most notably from its Creative Cloud offering, that are leaders in their market. Expanding net margins from the shift of its sales to its subscription plans offering. Recurring revenue from its subscription plans. Expanding market in digital media, web development, graphic design, animation, etc. Gaining market shares outside of the United States, most notably in Europe and in the Asia-Pacific region. Even if the stock is currently trading at a price-earnings ratio above 50, its current momentum, expanding net margins and growth potential make ADBE a solid investment at its current market price. Disclosure: I/we have no positions in any stocks mentioned, but may initiate a long position in ADBE over the next 72 hours.